First of all. I have read many posts on this forum and I am truly amazed about all the knowledgeable people and the willingness to share knowledge and tips! Very valuable indeed! Yesterday I brewed my first allgrain BIAB brew with full volume and no sparging. Here is my short write-up. My equipment consist of a 50-liter kettle, a stainless steel grain basket and a plate chiller. 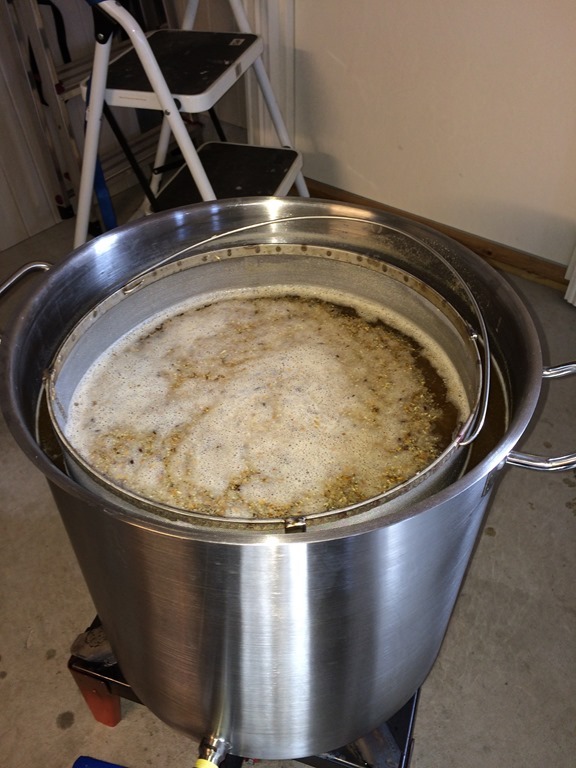 The brew was an 25 liter IPA allgrain set - with a fixed grain bill, pre-weighted hops, and a pack of Safale US-05. My main question is about BIABacus and how to adjust the "Desired volume into Fermentor (VIF)" versus the "What you will use" numbers suggested by BIABacus - against the fixed amount of grains I have. The WYWU-numbers are much higher than my fixed grain bill! This led me to experiment a little with VIF, in order to get the WYWU-numbers closer to my grain bill. Below you see how the numbers changed when I set VIF to 18.1 liter. The question is therefore; Is this right usage of BIABacus and correct thinking? Transferring the wort to the fermenter went somewhat slower than my test-run with water and it took a while before I understood that I could also reduce the water flow to increase the temperature of the flowing wort. Well it all ended up with a 24C wort, which I pitched. Last edited by rvoith on 20 Mar 2015, 17:08, edited 1 time in total. A Brewer Should Plan the Brew before Buying the Ingredients if Possible. A kit and pretty much all brewing software works backwards from best practice. A kit makes you think that it will make x L of beer but as the above shows, it wont. Similarly most brewing software has you typing in weights until you reach a desired OG. Both these practices are clumsy and far from accurate. What do I do Though if I have Already Bought the Ingredients or a Kit? You've worked this answer out on your own. Nice job! The answer, when you already have purchased a fixed amount of grain, is to play with the VIF in Section B until both sides of Section C match. The BIABacus does many calculations when you do this that no other software can. You have seen some of these. Also, things like the efficiencies in Section P will change as well as the hop amounts in Section D. Everything in a brew is very inter-related and the BIABacus is the only holistic brewing software out there. Note that unless you knew and had exactly the same equipment as the original brewer, you will never get both the grain and hop bill quantities to match a 'kit' ingredients. The best you can do if you have purchased a kit, is to juggle VIF to match the grains and let the hops (which depend greatly on VAW) fall where they may. On the next brew, if it is possible to buy ingredient weights to order, let's see if we can plan the brew first as it is a better, more accurate practice. The over-flow is a bit weird. Treat this one as an aberration as unless you have a way of double-checking the initial water you used (eg, weigh the water in on bathroom scales and a bucket and then check the headspace or depth with a ruler) there is no certainty that you did start with the correct amount of water. Filling in Section L can also help identify if an initial water measurement error occurred unless of course you hae a big spillage . I'm a little concerned about using the basket without a bag. A BIAB bag is actually very fine, much finer than any basket I can imagine. I'd really consider lining the basket with a fine BIAB bag. Make sure you keep that plate chiller very clean and sanitised. You live in Norway... Why do you even need a chiller? I thought you could just blow on the wort for five minutes? Last edited by PistolPatch on 20 Mar 2015, 18:07, edited 1 time in total. PistolPatch - Thank you very much for your quick response!! I am glad I understood the concept correctly with BIABacus. During the mash (even though my first batch had too much water, the OG is too low and what-not - I put into my learning curve anyway :-)) the numbers in the first screen shot in section K ("Your Estimated Volumes") actually played out pretty good. I will look into a traditional BIAB bag too. On my next batch I will use a little steel bowl as a rest for the basket, so over-flow in the future won't be a problem. Thanks again!! rvoith - I have seen stainless Brewing Baskets online. 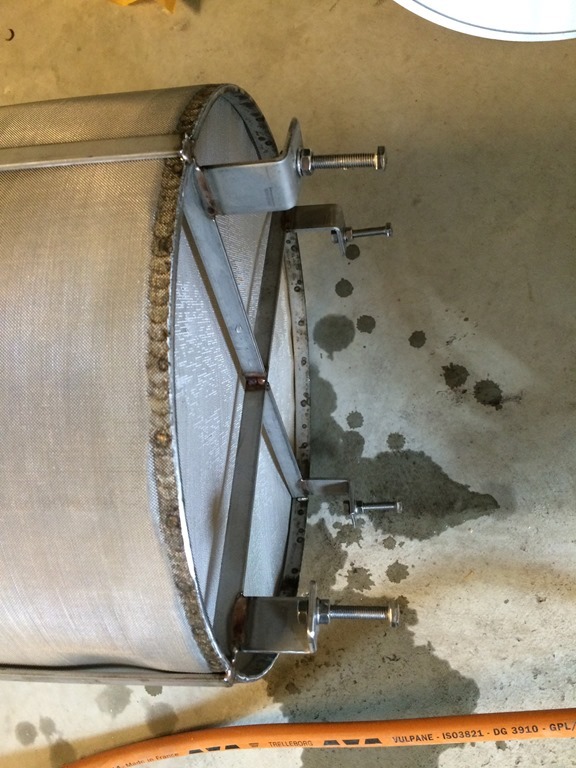 Some come with feet welded to the bottom to raise the basket off the kettle bottom and bring it close to the brim. Sounds like your idea will work. How did you lift the basket to drain into the kettle? Was the wort clear? Holy Cow! That is some pulley! I use rope hangers http://kampret.stasiunhp.com/apollo-hor ... 8r0600.htm and a ladder to lift and suspend the bag. First time I just lifted and held the bag. Never again! By clear wort I meant little or no trub, not actually clear. Yes, Utah Diesel Supply is where I saw the BIAB Basket. Nice! I believe PP was referring to the size of the holes between the mesh of the basket being larger than ideal. If the holes are too large you will get too much debris in the kettle. Adding a voile cloth bag in the kettle will help to keep that debris out of the wort. A little hard to see the real details on the mesh from the Norwegian web site page (http://www.bryggselv.no/products/biab-maltkurv" onclick="window.open(this.href);return false;), but from Utah Biodiesel Supply's brew-page (which I believe Bryggselv has sourced it's mash basket from - http://utahbiodieselsupply.com/brewingfilters.php" onclick="window.open(this.href);return false;) it looks like it is either 300 or 400 micron sized mesh. What would a BIAB bag-user normally recommend for the bags? Last edited by rvoith on 24 Mar 2015, 20:04, edited 1 time in total. Don't grind your grain fine. Just squash it or break it in two or three places. If you do this, instead of the hard, tanniny, lignin getting pulverised and forced into your brew, it will act as a nice filter. I was about to say that my first BIAB bag was about 20 threads per cm and used to drain much faster than the ones I have now but I have to learn to stop saying threads per cm I think . Just be sensible in your crush and then the 'bag' porosity becomes far less important. I certainly wouldn't have any problems giving what you have said, a go, even though I have never seen stainless cloth. Got a pic? Last edited by blu_afro on 24 Mar 2015, 20:58, edited 1 time in total. Mesh depends in the warp/whelp SIZE of threads, as in cloth. Micron Screen is the Size of the Holes in the material. A minor difference in Reality, but The Micron size is what we need consider to catch the Tiny Husk and Bran Debris. Example: a 300-400 Micron Screen has a hole size of .0165" to .0177" or .300mm to .400mm. From a company that makes Plastic Spheres..
Last edited by joshua on 24 Mar 2015, 21:36, edited 1 time in total. Rvoith. Thanks for the picture. I understand now what the overflow issue is all about. If you use a bowl to raise the basket rim above the water line I have some concerns regarding placement. If you put the bowl in upside down the water trapped under the bowl will never be in contact with the grains and sugars until it is removed. Another concern is that by lifting the basket you are restricting the amount of space for the grains and water to come into contact with each other essentially thickening the mash. An up and down stirring motion with a potato masher may help to get the water at the bottom in contact with the grains. I'm not sure how much of a difference it will make with the mash efficiency. Just some thoughts. Let us know how things work out on your next brew. rvoith. I have been thinking about your brewing basket. Have you found a solution yet? Lifting the basket with the smallest amount of displacement is ideal. Can you get longer stainless legs welded to the basket? Putting a bag in the basket and draping over the kettle sides would work, but then why have a basket at all? Let us know if you find a solution. Just curious. cfmcintosh - yes, I simply use stainless steel screews. You can see the screews here: http://www.bobsbittelillebryggeri.no/we ... G_3831.jpg. This was me once too. The draining came to a crawl. to drain. Live and learn. One pound of hop pellets. Last edited by Mad_Scientist on 11 Apr 2015, 02:12, edited 1 time in total. Mad_Scientist wrote: This was me once too. The draining came to a crawl. My keggle has a similar pickup tube and I get gobs of fine material coming through my counter-flow chiller into the fermenter. It must be mostly fine crush flour leaking out of the brew bag during the mash (I use hop sacks in the boil). I bought some #60 screen (250 micron) and did a shake test on my grain to see what is in there. It looks like maybe 5-10% of the crush is fine enough to go through the screen and my brew bag since they are about the same mesh size. The bag drains like a champ when I pull it, so I don't really want to change to muslin or something else. 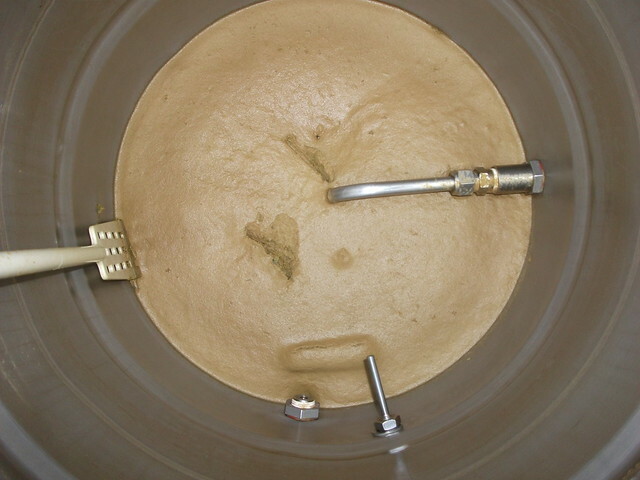 Question for the group: Is there a disadvantage to screening my grain to remove the flour before mashing? Obviously I have to make up for missing material in the grain bill, but the $3 more is worth it considering the hassle I seem to have with excess trub and chiller clogs at the end of the run. Last edited by CaliBrewer on 05 Sep 2015, 02:08, edited 1 time in total. Cal-brewer - Firstly that is an old photo and process. I use voile fabric bag for mashing and a paint strainer bag (a little more coarser) for a hop bag. I squeeze both bags and drain hot wort into a no chill container. That is rather simple for me. Not sure what material you are seeing, but I wouldn't worry about it. If so, try out the fabrics I use. Thanks Mad Scientist, I figured that was and old photo. It's an awesome one though! The no-chill process seems pretty simple since you can pour clear wort out of the cube after everything settles. I'll probably have to try the voile bag eventually after I put some more wear on this one (bought it on the internet, and it has nice hoisting handles and stitching). Time for me to stop worrying about the huge trub cake. It just looks messy going into the ferementer. The flavor is great and a cold-crash clears everything up anyway.